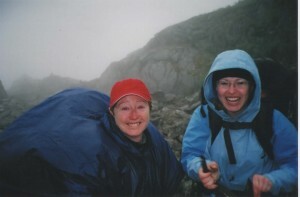 This year I celebrated my 10th anniversary since I climbed the Chilkoot Trail. 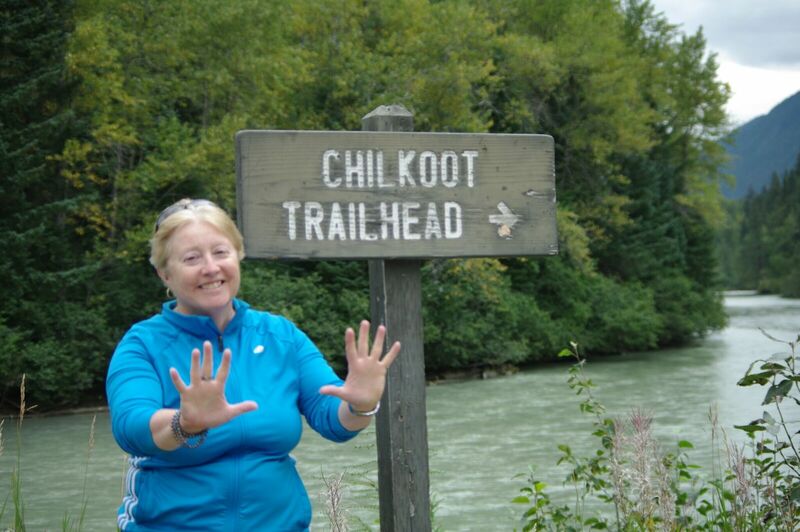 Luckily, I was in the Yukon this past August for both personal and work reasons, and definitely on my ‘must do’ list was to go back to visit the Chilkoot Trailhead. 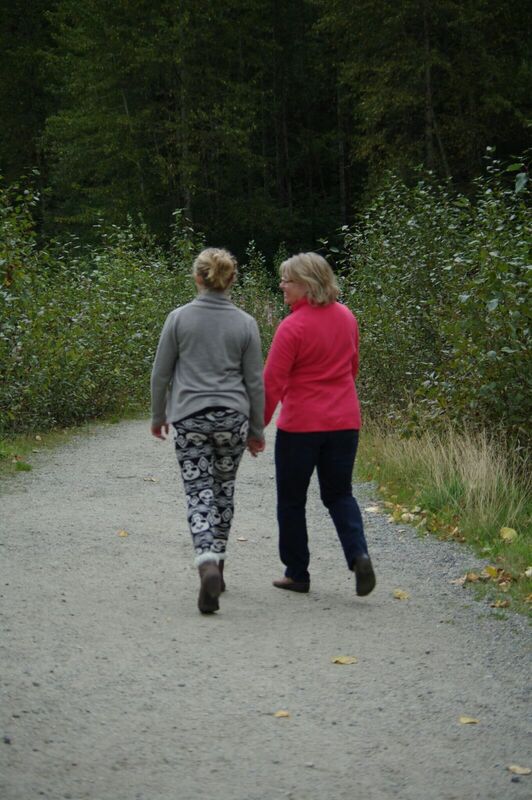 After a lovely visit in Skagway with my sister Lucille, and my niece Sophie, we drove off the main highway and made our way to the trailhead to where it all started. Once there, I was surprised to see how much the area had filled in with trees and vegetation. The little registration station is now gone most likely opting for an electronic sign-in. The beautiful Taiya river, however, was flowing ever so strongly and majestically, and I felt like I was being greeted by an old friend. My sister and I started talking about our experience on the Trail as well as what had changed in our lives since our hike. Certainly there had been a lot of changes in the past 10 years, most memorable being changes in our work life and career; the loss of so many loved ones including our parents; and health issues. But for the most part, despite heartache and losses, there was a lot of personal and professional growth as well. We both had had new wonderful and rich experiences to meet great new people and to try new things that provided us with purpose, fulfillment and happiness. I enjoyed our little journey down memory lane and am very grateful for all of the lessons that I learned while on the Trail. I truly believe that the strength and courage that I had to find within me to complete the trek has helped me tremendously to weather life’s little storms and to come through the tough situations even stronger and more resilient. 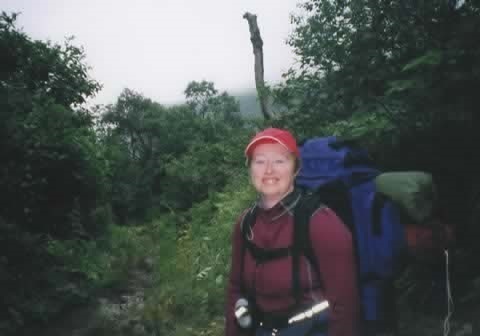 If you’re interested in finding out the life and leadership lessons I learned while on the Chilkoot Trail, I invite you to visit my six part ‘What the Chilkoot Trail Taught Me about Leadership,’ blog series. Here is Part 1 of the series. Enjoy. Marielle Gauthier, owner and principal of Redworks Communications, is a certified Results coach, an Associate Certified Coach (ACC) with the International Coaching Federation; and soon a Certified Conversational Intelligence Coach. To receive updates about Marielle’s coaching program, training and webinars or for more information on coaching services connect with Marielle at marielle@redworkscoaching.com or visit www.redworkscoaching.com. She is based in Saskatoon, Saskatchewan. 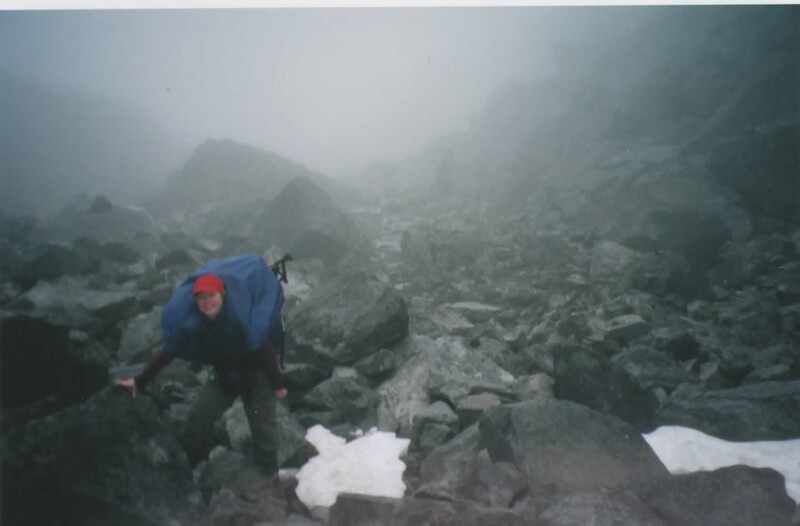 In part 4 and 5 of my Chilkoot Trail blog series, I told my story of how it took us 14 hours to hike over the summit from Sheep Camp to Happy Camp. We endured miserable weather throughout the day – cold, rainy and very windy. 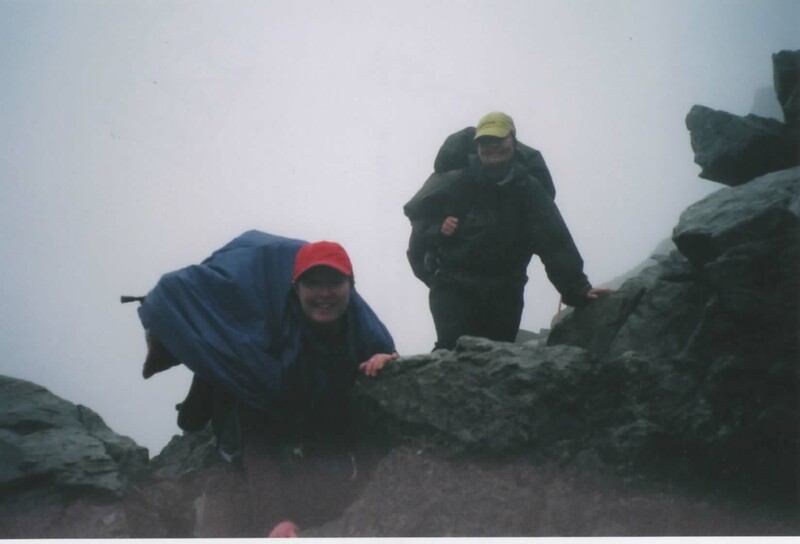 At times, especially hiking up to and down from the summit I was quite frightened as I was afraid we would either be blown off the mountain or slip careening down the mountain. Luckily, neither happened. We arrived into Happy Camp exhausted, cold, wet and hungry but at least we we’re safe. In this blog, I am going to talk about the decision we had to make that would impact the rest of our trip. Morning finally came after a fitful night with pelting rain and gale-force winds that beat the sides of our tent causing it to shake violently. Also keeping me awake was whether or not I could continue due to my physical injury. I was conflicted between wanting to finish the hike and not wanting to cause further and perhaps worse injury. As we left our tent, we were very thankful that it was still in one piece. We made our way to the communal hall so for breakfast and discuss our plans for the day – who was going to continue and who was going to go home. It would take us another three days to hike the remaining 13 miles / 20 km to Lake Bennet where we would catch a train back to Skagway and our vehicle. If we missed this train we would have to wait a couple of extra days for the next one. We had to make a decision at this point. I was honest and said that I was in a lot of pain as my knee and now ankles were very swollen, decreasing my strength and stability. I did not want to slow them down nor put us in a dangerous position where I wouldn’t be physically able to continue. My sister was also unfortunately feeling the pain of her injury and didn’t want to risk further injury. So my sister and I talked and we both agreed that our hike ended here at Happy Camp. We strongly encouraged our hiking partner, Michelle, who was absolutely well enough to continue on, to join another party of women who we’re leaving in a few hours. Michelle flatly refused and said no, that we had made a pact at the beginning of the hike, that we we’re in this together, so she was coming home as well. The only way off the Chilkoot Trail and out of Happy Camp was by calling an airlift – an expensive helicopter ride. The Parks Canada Warden chartered a helicopter to come and pick us up later that morning. As much as I felt relieved that I was leaving I was also very disappointed that I wasn’t going to finish the hike. But I knew that was my ego talking and I knew that this was the best decision for me. In my heart, I knew we had accomplished what we had set out to do – to climb the Chilkoot Pass. I am definitely proud of having been able to accomplish this. And we did get to see the Yukon’s beautiful, rugged and awe-inspiring pristine environment from a unexpected vantage point. I found some footage of Happy Camp, Yukon and our helicopter ride. Have fun viewing the videos. Be proud of what you accomplish even if you don’t quite complete what you set out to do. Don’t let your ego dictate what is right for you – find your courage and voice what you need despite the feelings of failure that your ego is screaming at you. Ask for help when you need it – let others in – you don’t need to do things alone. Human beings are hardwired to want to help out. Don’t leave your friends behind – honour the covenant or agreement made. Encourage others to meet their goals. In part 4 of my Chilkoot Trail blog series, I told my story of our climb from Sheep Camp to the Chilkoot Pass. This section was the most arduous of the hike and one of the most physical, emotional and mental challenges I have ever had to go through. This blog post will focus on our hike from the summit to Happy Camp. 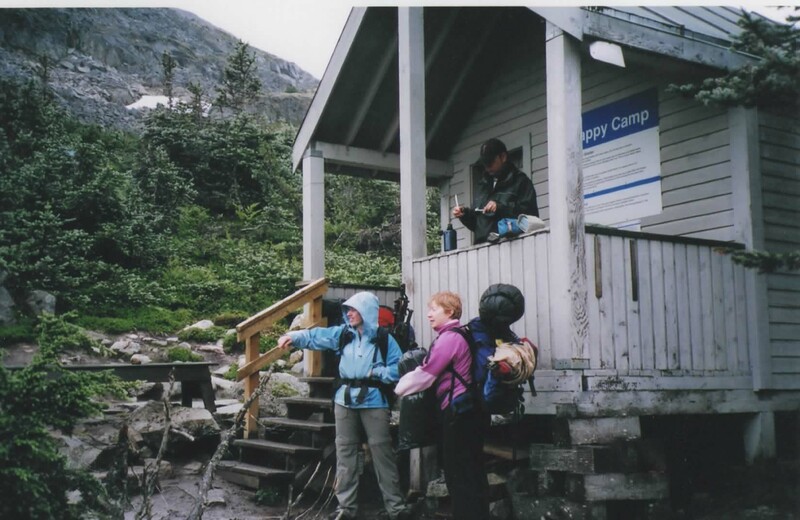 Having finally arrived at the top of the Chilkoot Pass at approximately 4 pm, we stopped at the Parks Canada warming cabin and warden station where we were finally able to eat a hot meal, change out of our drenched clothing, warm up and rest for a little while. We had arrived very late as we still had another 8.4 kms (4.0 miles) before we could lay our very sore bodies down at our next camp. I would have opted to camp at the shelter for the night, but there were signs prohibiting camping. We had also spoken to a park ranger earlier in the afternoon and had informed him of our health conditions, but that our plan was to reach Happy Camp that night. We wanted to avoid any international search parties sent out if we didn’t arrive. Somewhat rested, we headed out (it was now snowing and still howling) and started descending. I was very surprised at the number of snowfields that remained this late in the summer season. We didn’t have the right equipment to hike on snow and ice, so consequently we slipped and slid down the snowfields, but we miraculously all stayed upright. I found hiking down the mountain very challenging because of the snow, ice, and a shift in body weight to negotiate the descent. All of these factors added a lot of pressure on our legs, knees and ankles. We finally arrived at Happy Camp at 11:30 pm, completing a 14-hour hike (minus an hour or so) with a 25-pound pack. All we wanted to do was to get out of our wet clothes and eat a hot meal. Unfortunately the propane was out, so a hot meal or warming ourselves near a heater was out of the question. After resting a little, then changing into whatever we could find that was less wet, we found the strength and courage to face the weather to set up our humble accommodations for the night. Due to the very strong winds, we decided it would be safer to stay in one tent. I am thankful we did, as the wind was so strong that it pushed the sides of our tent up rolling us into the centre. Needless to say the hike over the summit from Sheep Camp to Happy Camp was quite frightening, but I was grateful that we were safe and had succeeded in climbing the Chilkoot Pass – a day I would always remember. As I tried to relax from the challenging day, I started thinking about the decision we would have to make tomorrow which would impact the rest of our trip. I realized I did not know much about first aid or pain management. So as a leader if you’re lacking required knowledge or an important skill, commit to doing something about it. 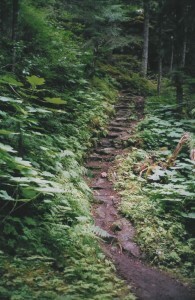 The first day on the trail – August 2006. We had spent the night at the Dyea campground just south of the Chilkoot trailhead. I was very excited and a little anxious about starting the hike and consequently didn’t sleep very well. I tossed and turned, going through all of my lists in my head, wondering if we had everything we needed for our journey. I also wondered would I be able to do this? Would we be able to do this? As it turned out my two travelling companions – Lucille, my youngest sister and her friend Michelle – had not slept very well either. After a huge breakfast prepared by my brother-in-law, we did our final checks, going through our itemized list for the umpteenth time. “Food – check; Tent – check; sleeping bag – check, first aid kit – check.” Ready! It was quite an amazing feeling to be at the trail head just 1 km North of Dyea – this historical spot where thousands of gold-hungry miners had also stood over 100 years before us. We signed into the registration log, took some photos, said our goodbyes to my sister’s partner and her two-year-old daughter, Sophie, exclaiming that we would see them in five days, and started our trek. We hiked through spectacular scenery of the Pacific northwest coastal forest in Alaska. Dense stands of alder, cottonwood, aspen, and spruce trees with mosses and ferns, at their feet. Amidst the rugged northern wilderness, we saw historical artefacts that told the story of the Klondike Gold Rush. We crossed narrow swinging bridges made out of wood and cabling; we hiked over gravel paths with exposed roots, and up and down slippery and muddy natural “rock stairs” more than likely carved out by the thousands of Stampeders throughout the Gold Rush and of course our contemporary counterparts. 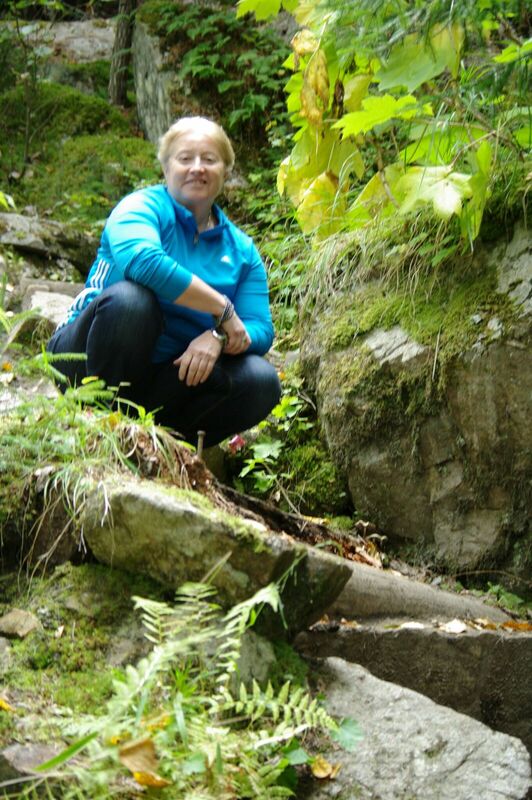 It was these natural rock stairs where I encountered trouble early on in the hike. Some of these steps were more than a foot high and the one trekking pole that I had brought with me broke, so I was not able to use it for support when going down. Stepping down the stairs without support caused me to overextend my right knee to the point of injuring it. Our original itinerary for the day was to stay at Pleasant Camp – 16.9 km (10.5 miles) from the trailhead. When we arrived, however, it was relatively early. We checked in with one another and decided that, since we still had some energy and light, we would hike another three kilometres to the next camp, called Sheep Camp. This was probably a mistake for me to hike the extra three kms, but I let my ego decide what was best for me. If my fellow hikers wanted to keep going, then I had to keep up. After walking a total of 18.9 km (11.8 miles) for an elevation of almost 1000 feet with a 25 pound pack (see blog #2), my legs were very shaky and knees were quite sore. Unfortunately, my right knee was also starting to swell. This was not a good sign. 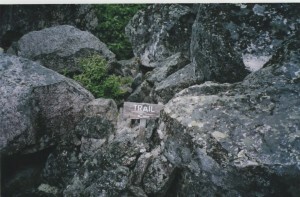 This first part of the trail was supposed to be relatively easy compared to the next day. We were planning to hike what was expected to be the most difficult part of the trail – the scales and the summit. I needed to act fast to stop the swelling, so I took a couple of Ibuprofen and soaked my knees in the river (yes it was very cold) with eyes looking out for hungry bears. Despite the injury, it had been a glorious day – an exhilarating hike in this majestic coastal forest –the natural environment was so green, lush, exposed, and raw. My body also felt raw and I collapsed into my sleeping bag and slept soundly. • Sometimes it’s better to stick to the plan – the plan had been made with lots of thinking and there were good reasons why we made that plan. • Do a check-in with yourself and be honest about how you’re feeling. Don’t allow your ego to push you into doing something you might not be ready for or want to do. Telling others you don’t want to, can’t or would rather not do something is not a sign of weakness. It’s an opportunity for dialogue. If I had been honest with myself and not let my ego make the decision, I am quite sure my travelling companions would have been fine with not going to the next camp. I would not have pushed myself beyond my physical limits that day and I would have had more time to rest. • Don’t let fear of the unknown rush the experience. 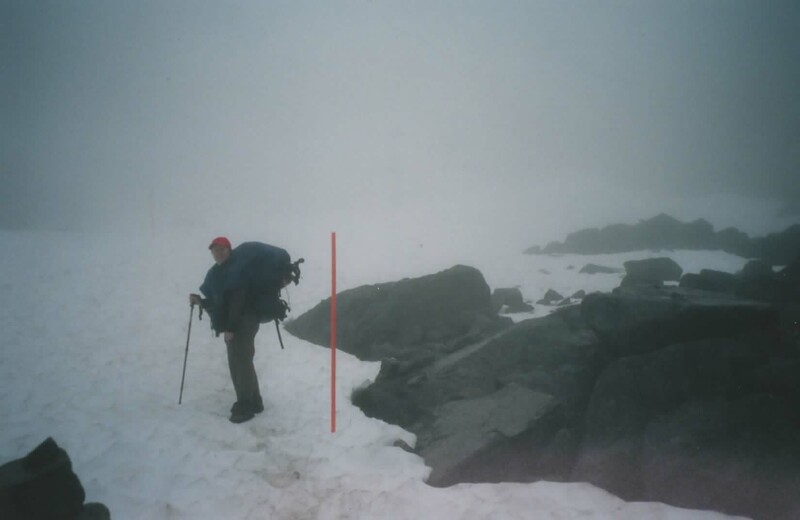 I remember wanting to push forward so badly so that we could get on with it and climb the summit! Looking back and thinking about this, I now think that this was because I did not know what we were going to encounter. This fear made me want to rush through it. 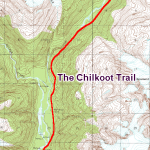 I love going on adventures and trying new things, so when I started hearing about this great hiking trail in the Yukon called the Chilkoot Trail, I was very intrigued. 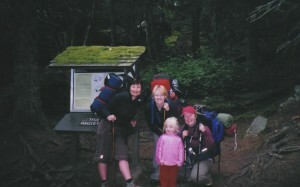 We completed our hiking party with a friend of hers, Michelle, and agreed that we would undertake the five day hike in August 2006. We filled out the necessary paperwork for our trail permits with Parks Canada and were excited to receive the approval for the dates for the hike. 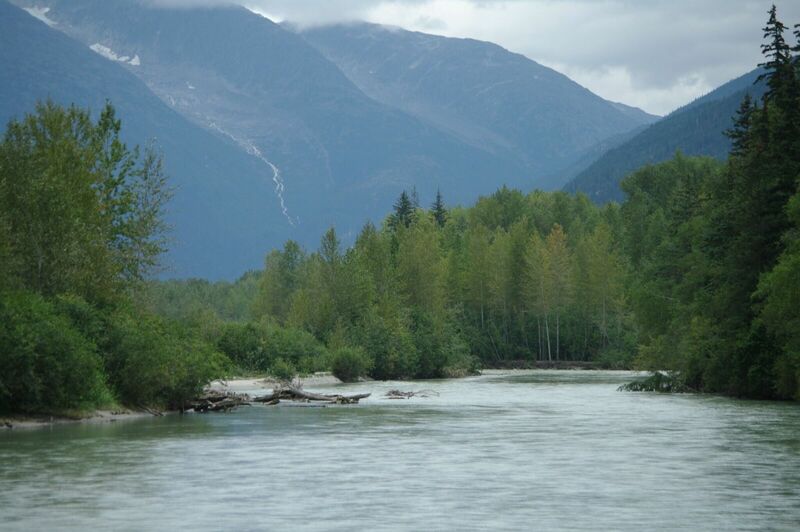 We bought our train tickets that would take us from Lake Bennett back to civilization (Skagway) – we were that confident. I looked up whatever information I could on the web, but didn’t have access to what the area was really like, what the conditions could be like, how challenging it was and in exactly what kind of shape you needed to be in. So we we’re going on the experience of others. They made it so how hard could it be! Again, I thought, “No worries. Let me think.” Well, I can do more squats to strengthen my legs for all of that climbing. So I added more squats. Speaking of climbing: How can I get some vertical challenges into my training? Well, I can drive out to the old Blackstrap ski hill – hmm that might be a little too far to do this every day. OK, what about the hill at Diefenbaker Park in Saskatoon. Sure that will work. What else? Hmmm… well I guess I can hike around the river bank. Sure, that will work. Now that I have a few areas that have a bit of height, what else? Well I need to get used to the extra weight on my back while I am hiking. How much weight will that be I wondered? I had no idea but I filled my pack with about 15 pounds of stuff and set out on short hikes around the City. So I added these elements – elevation and weight – to my training program for the two months before our hike. I believe my training certainly did help me get ready for the actual hike; however my actual pack ended up being much heavier – closer to 25 pounds. We wanted each of our packs to weigh roughly the same amount, so we removed whatever we could to make them lighter, but they still ended up being around the 25 pound mark. By the end of the first day, this pack felt a lot heavier and I did consider leaving stuff like my tent behind, as this was the heaviest item in my pack. I soon realized that would be a bad idea. If you’re preparing for a trip in the mountains – go to the mountains to train or at least go a few times so you have a small idea of what you may be encountering. Wherever your adventure takes you, go to a similar area to train. Go to an adventure/outfitter store and buy specific back-packing gear. I have seen amazing light gear that I would have loved to have had! Do tons of research – read up about the area, conditions, weather, etc. as much as possible. Look for videos, and ask a lot of questions of folks who have the experience. In short, be prepared and have a back-up plan just in case! 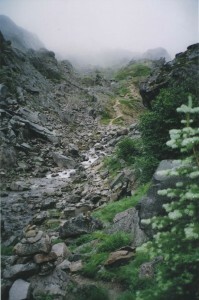 Hundreds of miners climb the Chilkoot Trail. This year, I had the pleasure of spending the Christmas holidays with my sister and her family in Whitehorse, Yukon. I have visited Whitehorse many times and I am always in awe of this City – the beauty and ruggedness of the land; its hardy and adventuresome people, and its amazing history. Reminders of the Klondike Gold Rush are everywhere. I always ask myself, what was it really like during the Gold Rush with thousands of people uprooting their lives and travelling long distances with great hopes and dreams of striking it rich? The strength, determination, perseverance, and just plain stubbornness it took for those miners to cross the rugged terrain to stake their claim was quite an incredible feat. I know that first hand as I hiked the Chilkoot Trail in 2006 without the required ton of goods and equipment. 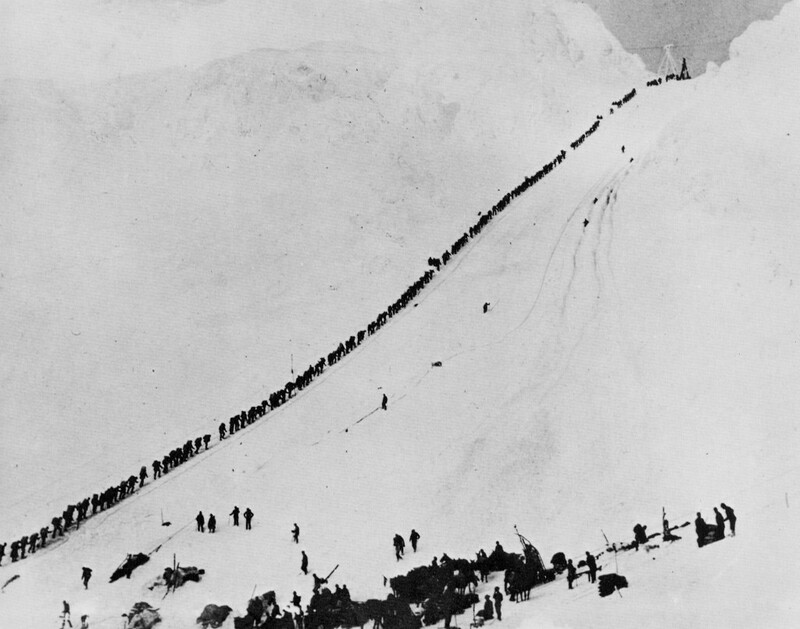 You may have seen one of the famous pictures of the Gold Rush era – that of a long line of men transporting their belongings over the summit of the Chilkoot Pass. It would take hours for someone to get back in line should they have the misfortune of falling out of line. 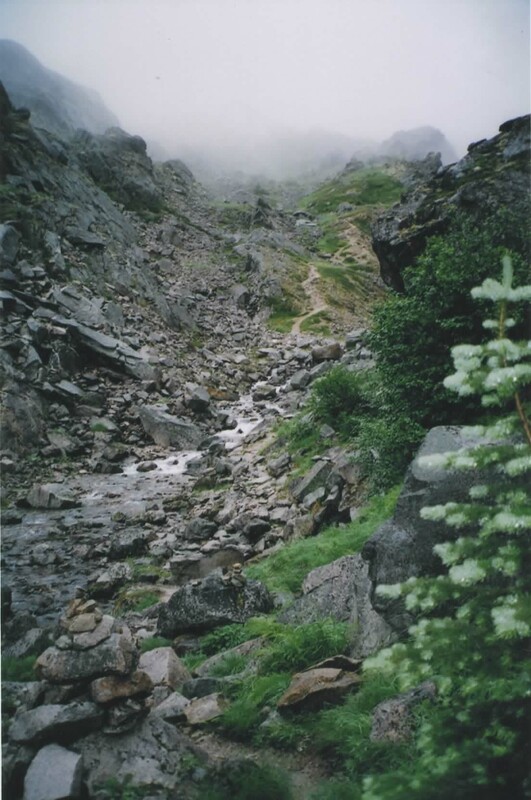 Chilkoot Trail Mail – Click for a full map. Why am I talking about this? 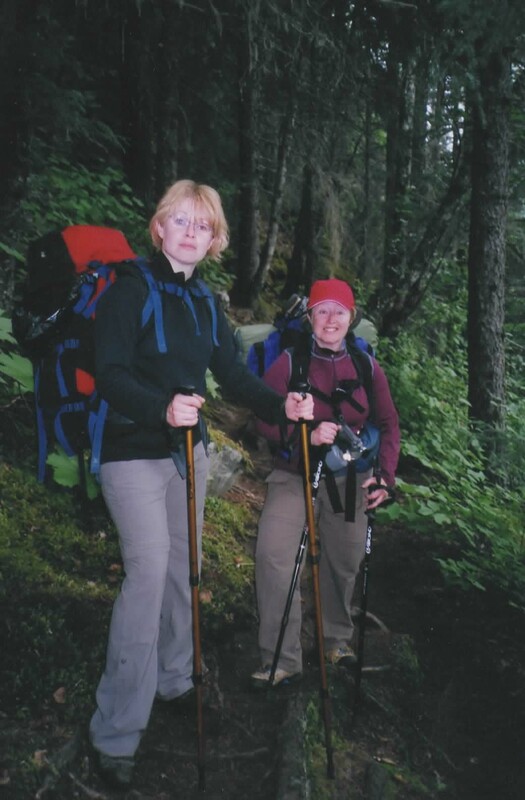 Well, during my visit this past Christmas, I had a chance to reminisce with my sister and a friend about our hike of the historical Chilkoot Trail – a 53 km (33 mile) of rugged Northern wilderness that tested thousands of gold-hungry dreamers. We shared laughter and stories while watching a video that I had shot during our journey for the first time. We looked at photos of our excited and nervous faces at the beginning of our trip, our exhausted faces and bodies at the end of each day, and the rugged beauty of this very special environment. The footage and the photos reminded me of some of the emotions I felt gazing upon some of the most beautiful, rugged, and pristine environments in Northern Canada – humble in the face of my own insignificance, and very much in awe of Mother Nature – her strength, power and beauty. It wasn’t lost on me, however, that this was serious business. We were not at a theme park where a customer service representative was just next door. We could get in serious trouble fast and would be at the mercy of the mountain. We also talked about what we learned about ourselves – the need to summon up the strength and courage to keep putting one step in front of the other despite the pain we felt, for example. I know for a fact that I learned a lot about myself on this journey – things that have helped me enormously in facing other big challenges in my life. So in this new year of 2015, I thought I would look back at this challenging journey and write about some of the greatest lessons I learned on the mountain and the impact it had on me. I greatly look forward to reminiscing with you about my journey on the Chilkoot Trail in this new blog series. Marielle Gauthier supports individuals to live their extraordinary lives by facilitating positive change.